Japan And South Korea Rattled By Trump's Talk Of Closing U.S. Bases : Parallels U.S. troops have been based in South Korea and Japan for decades. Removing them would shake up the entire region. U.S. Navy servicemen see off the nuclear-powered aircraft carrier USS George Washington as it leaves the U.S. naval base in Yokosuka, Japan, in 2015. In an English-language class at Seoul's Kookmin University, students practice conversation by discussing current events. And the election of Donald Trump is a global current event that's shaken them up. "In Korean, dey-bak means something happened unexpected," says Youjin Lee. Such as the unexpected result of the American election. It brings big uncertainty for U.S. foreign policy around the globe, including Northeast Asia. During the campaign, Trump argued that alliance partners don't pay their fair share for U.S. military bases in their countries and suggested he could pull them out. "We defend Japan. We defend Germany. We defend South Korea. We defend Saudi Arabia. We defend countries. They do not pay us what they should be paying us because we are providing a tremendous service and we're losing a fortune," Trump said during the first presidential debate. In truth, South Korea and Japan have both paid billions over the years to support the bases within their borders. And America has wanted to be there for its own security reasons. "Trump has said some tough things about America's alliance relationships around the world," says Robert Kelly, who teaches international relations at South Korea's Pusan University. "On the other hand, Trump's also sort of wildly reversed himself. So there's a lot of uncertainty about what he actually wants to do." "I'll be honest and say I don't think he really knows himself," Kelly adds. "I don't think he really knows a great deal or cares a great deal about foreign affairs." Trump did speak by phone Thursday with both Japan's Prime Minister Shinzo Abe and South Korean President Park Geun-hye. In both calls, Trump said he would support the current security alliances with the Asian democracies. He told Park, "We are with you all the way." 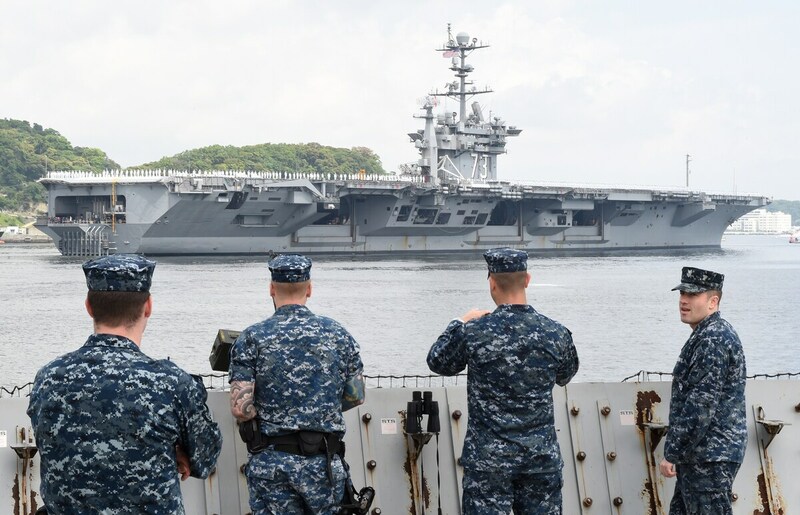 But the cost-sharing agreement between the U.S. and South Korea on maintaining bases is coming up for renegotiation next year. Korea paid $850 million dollars for base maintenance in 2014, according to its budget. But Trump foreign policy adviser Pete Hoesktra said this week maybe that's not enough. "The threats that they face — if they're not willing to pay for it or if they just go into it saying, 'We don't have to worry about it, the United States is going to pay for it,' that is not a healthy relationship," Hoekstra said. Beyond security, Trump's rhetoric has been toughest on trade. "There's anxiety for what Trump means for trade relationships, because he's really hammered on that," Kelly says. "Asian trading, exports are really important for economies out here." Kelly says changes to trade agreements would have punishing effects on export-driven Asian economies and on prices back home in the U.S.
"If he really throws up tariff barriers, that will drive up the prices of Asian goods. Samsung televisions and Honda Civics and whatnot would be significantly more expensive," Kelly says. But just what a Trump administration will do when it's in power is unknown — and not only to Americans. Korean college student Yuseok Kang surveyed his friends for their reactions. "They all are worried about side effects by his election," Kang says. "And they are worried about what he's going to do next."